Patients with diabetes have poorer outcomes after percutaneous coronary intervention than patients without diabetes. The Cre8™ EVO drug-eluting stent (DES) has design features that aim to improve clinical outcomes in patients with diabetes. These include Abluminal Reservoir Technology – a proprietary polymer-free drug-release system consisting of reservoirs on the abluminal surface of the stent that control drug release and direct the drug exclusively towards the vessel wall – and the Amphilimus™ drug formulation, which enables enhanced drug–tissue permeation utilising fatty acid transport pathways. The latter is particularly advantageous in patients with diabetes, whose cell metabolism favours increased cellular uptake of fatty acid. Furthermore, evidence suggests that mTOR inhibitors (-limus drugs) utilised in conventional DES are less effective in diabetic cells. The new stent architecture provides high device deliverability and conformability, facilitating clinical use in complex disease patterns and high-risk lesion morphologies. Clinical evidence for the efficacy and safety of the Cre8™ DES in patients with diabetes has been demonstrated in a number of clinical trials and observational registries. These data are reviewed herein, along with an overview of on-going randomised trials. Dr Byrne has received research grants from Boston Scientific and Heartflow, and lecture fees from B. Braun Melsungen, Biotronik and Boston Scientific. Dr Colleran has received a research grant from the Irish Board for Training in Cardiovascular Medicine, sponsored by MSD. Dr Banai and Dr Colombo have no conflicts of interest to declare. Newer generation polymeric metallic drug-eluting stents (DES) have shown improved efficacy and safety compared with bare-metal stents and first-generation DES, improving patient outcomes after percutaneous coronary intervention (PCI) and facilitating the treatment of more complex coronary disease.1 However, clinical outcomes in certain lesion and patient subsets remain suboptimal. Procedural and/or technological refinements may improve success rates in such scenarios. Patients with diabetes represent one such complex subgroup as they continue to have worse outcomes following PCI compared with patients without diabetes.2 The latest DES technological enhancements may have an important impact in improving the outcomes of these patients. The Cre8™ EVO (Alvimedica) represents novel DES technology that features laser-cut reservoirs on the abluminal surface of the stent that support the controlled polymer-free elution of Amphilimus™. In the current review, we discuss coronary revascularisation in patients with diabetes, with a focus on the latest efficacy and safety data from studies evaluating the Amphilimus™ polymer-free DES and its latest iteration, the Cre8™ EVO stent, in patients with diabetes. European guidelines for clinical practice recommend coronary artery bypass graft (CABG) surgery in preference to PCI in diabetic patients with multivessel disease, with PCI considered a treatment alternative in patients with a low SYNTAX score (≤22).17 However, randomised trials comparing PCI with CABG in patients with diabetes are somewhat outdated. The largest trial to compare PCI with CABG for the treatment of multivessel coronary artery disease in diabetic patients was the Future Revascularization Evaluation in Patients with Diabetes Mellitus: Optimal Management of Multivessel Disease (FREEDOM) trial, which found CABG to be superior to PCI with respect to the primary endpoint, the combined incidence of death, non-fatal MI or stroke. This was driven by a reduction in both non-fatal MI and death in the CABG group, albeit with an almost two-fold higher incidence of stroke.18 However, the trial is limited by the use of first-generation DES in 94 % of patients in the PCI group. Moreover, of 33,000 patients screened, only 1,900 (5.7 %) were enrolled, only 2.5 % of enrolled patients had a left ventricular ejection fraction <40 %, and only 35.5 % had a SYNTAX score ≤22 – all factors limiting the external validity of results. Other randomised trials comparing PCI and CABG were underpowered with respect to their primary outcome measures. Both the Coronary Artery Revascularization in Diabetes (CARDia) study19 and the Veterans Affairs Coronary Artery Revascularization in Diabetes Study (VA CARDS) were terminated early due to slow enrolment.20 The CARDia trial enrolled 510 of the 600 patients planned and failed to show non-inferiority of PCI versus CABG with respect to the combined incidence of death, MI or stroke. VA-CARDS randomised only 207 (3 %) of 6,678 patients screened, representing only one-quarter of the planned sample size. Both trials were also limited by the use of first-generation DES as well as bare-metal stents in the CARDia study. Finally, a subgroup analysis of patients with diabetes enrolled in the Synergy between PCI with TAXUS and CABG (SYNTAX) study (n=452)21 found no significant difference in the combined incidence of all-cause death, MI or stroke between the two groups, although the trial was not designed to show such a difference in subgroups. Despite the fact that patients with diabetes fared worse than patients without diabetes in the SYNTAX trial, the presence of diabetes was not found to be independently associated with increased risk of major adverse cardiac events in multivariable analysis. Another factor contributing to the relative lack of efficacy of mTOR inhibitors in patients with diabetes is the impact of hormones. Being overweight is a strong risk factor for diabetes and cardiovascular disease; >90 % of patients with type 2 diabetes are overweight or obese.26 Human obesity is associated with elevated levels of leptin, a hormone secreted by adipocytes and perivascular tissue, particularly in overweight patients. 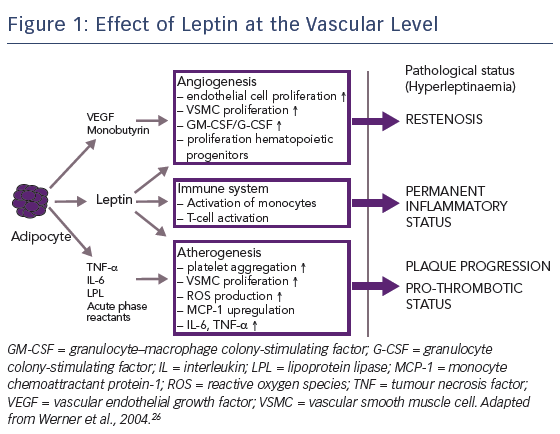 Leptin has a number of specific vascular effects: first, it promotes angiogenesis, which contributes to restenosis; second, it activates the immune system, resulting in a permanent inflammatory status; and third, it accelerates atherogenesis, promoting plaque progression, see Figure 1.27,28 A nine-fold increase in the dose of sirolimus has been shown to be required to inhibit leptin-induced intimal hyperplasia.29 Therefore, in order to improve PCI efficacy in patients with diabetes, the concentration of drug level attained in diabetic cells needs to be increased. The Randomized Comparison of Reservoir-based Polymer-free Amphilimus™-eluting Stents versus Everolimus-eluting Stents in Patients with Diabetes Mellitus (RESERVOIR) clinical trial enrolled 112 patients with diabetes on glucose-lowering therapy with a single de novo lesion in a maximum of two coronary arteries.37 Participants were randomised to treatment with the Cre8™ stent (n=56) or a XIENCE™ (Abbott) EES (n=56). The primary endpoint was mean neointimal hyperplasia volume obstruction as measured by optical coherence tomography after 9 months, and was numerically lower in the Cre8™ group compared with the XIENCE group (11.97 ± 5.94 % versus 16.11 ± 18.18 %; p=0.0003 for noninferiority; p=0.22 for superiority). Prespecified subgroup analyses showed a consistent treatment effect in favour of the Cre8™ arm across all subgroups. Importantly, this difference was statistically significant in the subgroup with suboptimal metabolic control (Hb1Ac greater than the median value; p=0.02). In terms of secondary endpoints, angiographic LLL in the Cre8™ group was 0.14 ± 0.24 compared with 0.24 ± 0.57 in the XIENCE group, with a striking difference in standard deviations that highlights the consistent performance of the Cre8™ DES. 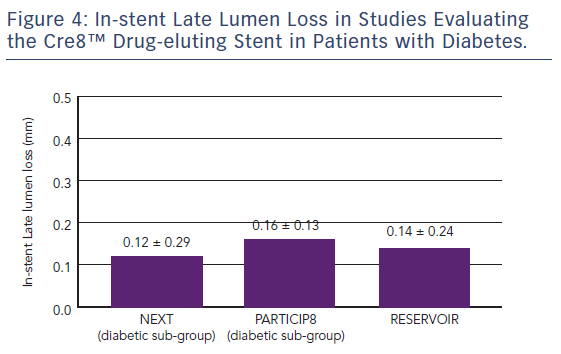 There was also a trend towards a larger minimum lumen diameter in the Cre8™ versus the control group in-stent (2.38 ± 0.44 versus 2.19 ± 0.59; p=0.07) and in segment (2.09 ± 0.59 versus 1.84 ± 0.61; p=0.02). Notably, the degree of LLL observed in RESERVOIR was consistent with that already seen in the NEXT trial and the Prove Abluminal Reservoir Technology Clinical benefit in all comers patients (pARTicip8) observational study, see Figure 4. There were no differences between the Cre8™ or XIENCE groups with respect to any clinical endpoint, including cardiac death (1.8 % versus 0 %, respectively; p=1.0), myocardial infarction (0 % versus 1.8 %, respectively; p=1.0), definite or probable stent thrombosis (1.7 % versus 1.7 %, respectively; p=1.0) or repeat revascularisation (TLR 5.2 % versus 8.6 %, respectively; p=0.46). However, the study was underpowered to detect such differences between treatment groups. While the growing body of randomised and observational data supports the efficacy of the Cre8™ DES, studies to date have not been powered to demonstrate superiority over comparator DES. Against this background, a large randomised study – the Second-generation drUg-elutinG stents in diAbetes: a Randomised Trial (SUGAR Trial) – is planned. The trial aims to randomise 1,164 “all-comer” patients undergoing PCI at 29 centres in Spain to treatment with the amphilimus-eluting stent or a zotarolimus-eluting stent in a 1:1 ratio. The primary endpoint, TLF – defined as the composite of cardiac death, target vessel MI and TLR – will be assessed at 12 months for non-inferiority and at 24 months for superiority. A second randomised trial, the Clinical benefit in “all comer” patients with DIABetes to prove Cre8™ EVO (Diab8) study,39 aims to recruit 3,040 all-comer patients with diabetes undergoing PCI at 54 international sites. Patients will be randomised in a 1:1 treatment allocation to the Cre8™ EVO stent or an EES. The primary endpoint is TLR at 12 months. There will be a sequential analysis for non-inferiority and then for superiority. Secondary endpoints include cardiac death and target vessel MI at 12 months and TLR (superiority) at 24 months. In summary, the Cre8™ DES has shown promising results in the treatment of patients with diabetes in both subgroup analyses of randomised trials and observational studies. The large-scale SUGAR Trial and Diab8 study aim to provide randomised evidence to support the efficacy and safety of the Cre8™ and Cre8™ EVO stents in patients with diabetes. The rising prevalence of diabetes worldwide has made effective treatments for people with diabetes an urgent priority. However, current revascularisation strategies remain suboptimal in this subset of patients. Patients with diabetes have worse outcomes compared with the general patient population following revascularisation, and second-generation DES have failed to significantly impact on outcomes in such patients. The Cre8™ DES utilises abluminal reservoirs that slowly elute the Amphilimus™ formulation to overcome -limus resistance and the proliferative effect of hormones in diabetic cells, and thus increase cellular uptake of sirolimus. 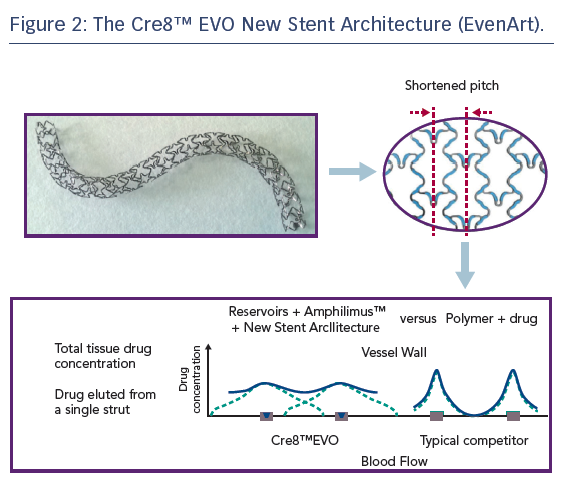 The new stent architecture of the Cre8™ EVO stent – EvenArt – is designed to enhance the elution profile in challenging anatomies. Finally, a growing body of randomised and observational data suggests favourable comparative performance of the Cre8™ DES with other DES in patients with diabetes. The results of large-scale randomised trials specifically comparing the Cre8™ or Cre8™ EVO DES with current-generation DES in diabetic patients are eagerly awaited. Byrne RA, Serruys PW, Baumbach A, et al. Report of a European Society of Cardiology–European Association of Percutaneous Cardiovascular Interventions task force on the evaluation of coronary stents in Europe: executive summary. Eur Heart J 2015;36:2608–20. Berry C, Tardif JC, Bourassa MG. Coronary heart disease in patients with diabetes: part II: recent advances in coronary revascularization. J Am Coll Cardiol 2007;49:643–56. Mehran R, Dangas GD, Kobayashi Y, et al. Short- and long-term results after multivessel stenting in diabetic patients. J Am Coll Cardiol 2004;43:1348–54. Abizaid A, Costa MA, Centemero M, et al. Clinical and economic impact of diabetes mellitus on percutaneous and surgical treatment of multivessel coronary disease patients: insights from the Arterial Revascularization Therapy Study (ARTS) trial. Circulation 2001;104:533–8. Flaherty JD, Davidson CJ. Diabetes and coronary revascularization. JAMA 2005;293:1501–8. Alderman EL, Corley SD, Fisher LD, et al. Five-year angiographic follow-up of factors associated with progression of coronary artery disease in the Coronary Artery Surgery Study (CASS). CASS Participating Investigators and Staff. J Am Coll Cardiol 1993;22:1141–54. Harskamp RE, Park D. Percutaneous coronary intervention in diabetic patients: should choice of stents be influenced? Expert Rev Cardiovasc Ther 2013;11:541–53. Kim WJ, Lee SW, Park SW, et al. Randomized comparison of everolimus-eluting stent versus sirolimus-eluting stent implantation for de novo coronary artery disease in patients with diabetes mellitus (ESSENCE-DIABETES): results from the ESSENCE-DIABETES trial. Circulation 2011;124:886–92. Stone GW, Kedhi E, Kereiakes DJ, et al. Differential clinical responses to everolimus-eluting and paclitaxel-eluting coronary stents in patients with and without diabetes mellitus. Circulation 2011;124:893–900. Park KW, Lee JM, Kang SH, et al. Everolimus-eluting Xience v/Promus versus zotarolimus-eluting resolute stents in patients with diabetes mellitus. JACC Cardiovasc Interv 2014;7:471–81. Windecker S, Haude M, Neumann FJ, et al. Comparison of a novel biodegradable polymer sirolimus-eluting stent with a durable polymer everolimus-eluting stent: results of the randomized BIOFLOW-II trial. Circ Cardiovasc Interv 2015;8:e001441. Denardo SJ, Carpinone PL, Vock DM, et al. Detailed analysis of polymer response to delivery balloon expansion of drug-eluting stents versus bare metal stents. EuroIntervention 2013;9:389–97. Kukula K, Klopotowski M, Kunicki PK, et al. Platelet aggregation and risk of stent thrombosis or bleeding in interventionally treated diabetic patients with acute coronary syndrome. BMC Cardiovasc Disord 2016;16:252. Farkouh ME, Domanski M, Sleeper LA, et al. Strategies for multivessel revascularization in patients with diabetes. N Engl J Med 2012;367:2375–84. Kapur A, Hall RJ, Malik IS, et al. Randomized comparison of percutaneous coronary intervention with coronary artery bypass grafting in diabetic patients. 1-year results of the CARDia (Coronary Artery Revascularization in Diabetes) trial. J Am Coll Cardiol 2010;55:432–40. Kamalesh M, Sharp TG, Tang XC, et al. Percutaneous coronary intervention versus coronary bypass surgery in United States veterans with diabetes. J Am Coll Cardiol 2013;61:808–16. Kappetein AP, Head SJ, Morice MC, et al. Treatment of complex coronary artery disease in patients with diabetes: 5-year results comparing outcomes of bypass surgery and percutaneous coronary intervention in the SYNTAX trial. Eur J Cardiothorac Surg 2013;43:1006–13. Jung JH, Tantry US, Gurbel PA, et al. Current antiplatelet treatment strategy in patients with diabetes mellitus. 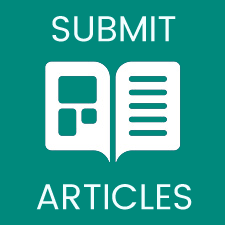 Diabetes Metab J 2015;39:95–113. Woods TC. Dysregulation of the Mammalian target of rapamycin and p27Kip1 promotes intimal hyperplasia in diabetes mellitus. Pharmaceuticals (Basel) 2013;6:716–27. Lightell DJ, Jr., Woods TC. Relative resistance to Mammalian target of rapamycin inhibition in vascular smooth muscle cells of diabetic donors. Ochsner J 2013;13:56–60. Obesity Society. Your Weight and Diabetes. 2015. Available at: http://www.obesity.org/content/weight-diabetes (accessed 6 November 2017). Werner N, Nickenig G. From fat fighter to risk factor – the zigzag trek of leptin. Arterioscler Thromb Vasc Biol 2004;24:7–9. Schafer K, Halle M, Goeschen C, et al. Leptin promotes vascular remodeling and neointimal growth in mice. Arterioscler Thromb Vasc Biol 2004;24:112–7. Shan J, Nguyen TB, Totary-Jain H, et al. Leptin-enhanced neointimal hyperplasia is reduced by mTOR and PI3K inhibitors. Proc Natl Acad Sci U S A 2008;105:19006–11. CARRIé D. Advances with polymer-free amphilimus-eluting stents. Minerva Cardioangiol 2016;64:339–53. Glatz JF, Luiken JJ, Bonen A. Membrane fatty acid transporters as regulators of lipid metabolism: implications for metabolic disease. Physiol Rev 2010;90:367–417. Moretti C, Lolli V, Perona G, et al. Cre8™ coronary stent: preclinical in vivo assessment of a new generation polymer-free DES with Amphilimus™ formulation. EuroIntervention 2012;7:1087–94. Morgan KP, Kapur A, Beatt KJ. Anatomy of coronary disease in diabetic patients: an explanation for poorer outcomes after percutaneous coronary intervention and potential target for intervention. Heart 2004;90:732–8. Carrié D, Berland J, Verheye S, et al. A multicenter randomized trial comparing amphilimus- with paclitaxel-eluting stents in de novo native coronary artery lesions. J Am Coll Cardiol 2012;59:1371–6. Romaguera R, Gomez-Hospital JA, Gomez-Lara J, et al. A Randomized Comparison of Reservoir-Based Polymer-Free Amphilimus™-Eluting Stents Versus Everolimus-Eluting Stents with Durable Polymer in Patients with Diabetes Mellitus: The RESERVOIR Clinical Trial. JACC Cardiovasc Interv 2016;9:42–50. Godino C, Pivato CA, Chiarito M, et al. Polymer-free amphilimus-eluting stent versus biodegradable polymer biolimus-eluting stent in patients with and without diabetes mellitus. Int J Cardiol 2017;245:69–76.